home is where they send us...: Planning. Floor Planner. Organization. I am getting really excited about the move. I found this awesome site (thanks Mikal) called Floor Planner. You can enter in your room dimensions and basically build a floor plan of your house. Then, you can take the furniture and move it around to see how you want things. I have the measurements of our new place so I went to town and made a floor plan. At first, it didn't work out BUT then I got it and I think both of us are very excited now about the house. Ideally, I would have a couple more organizational things for the soup and odd extras but I'm happy with it. All the baskets are storing tons of food. That red basket next to the goldfish has over 200 individual snacks - I kid you not!!! Now, hopefully I can make our kitchen in Ohio fabulous too! 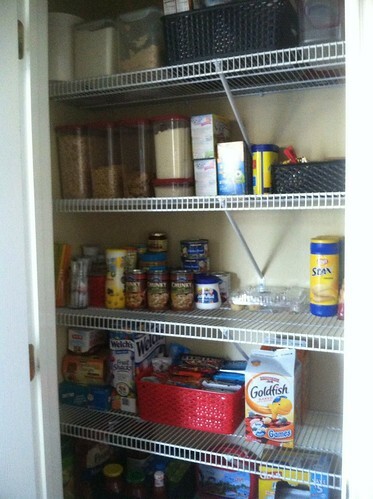 I got the idea from this blog (also linked from Mikal) that you can find here I Heart Organization Home Tour. Usually, we stick to neuutral colors but last night we were talking about accents. I'm sure that we are going to make the home in Ohio a perfect place for us. I have not been on pinterest too much lately but I do plan on continuing to pin some fun projects. I'm looking for kid friendly bath ideas, boy room ideas, girl room ideas, homeschool ideas...so, if you have something you think screams our names please forward me the information! !